Joseph Pratt | Daily Times Taryn Malone standing before the Library’s ART Gallery. The rainy July days have left outdoor activities slim, but the Portsmouth Public Library (PPL) continues its indoor programming within the cool and comfortable atmosphere of its many branches all over Scioto County. Of its programs, its artistic outlet in the main branch library, known as the Appalachia Regional Talent (ART) Gallery has been going strong and updates with a new featured exhibit each month. 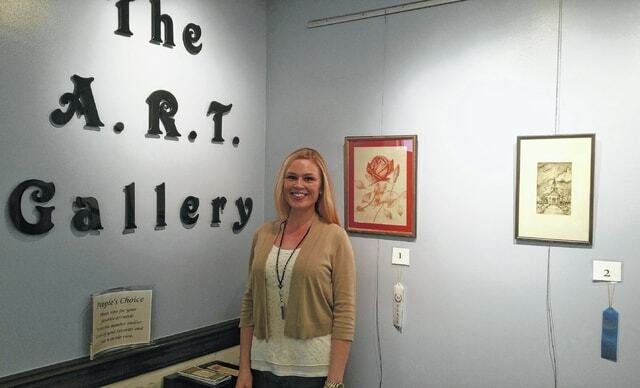 ART recently underwent a change in direction, with the new organizer being Taryn Malone. Malone has been employed by PPL for three years, all of which were completed at the South Webster location, until her recent transfer to Portsmouth. The featured mediums for July 2015 are Pencil/Pen/Charcoal/Pastel and Watercolor. The artwork can also be viewed online at www.yourppl.org. Submission forms can also be completed online, but artwork requires approval through the PPL director. There is also an online ballot on the website for public voting of the People’s Choice Award. The Portsmouth Public Library is at 1220 Gallia Street, Portsmouth. Their hours of operation are Monday, Tuesday and Thursday from 10 a.m. to 8 p.m., Tuesday and Friday from 10 a.m. to 6 p.m. and Saturday from 10 a.m. to 5 p.m.